The smartphone is a wonderful thing. I hadn’t really understood the full benefits of said device until I finally broke down and purchased an iPhone. Now the entire second page of apps is devoted to 2ITB, fantasy football and other sports applications. One application I’m happy to have been turned on to is the Accuscore app. 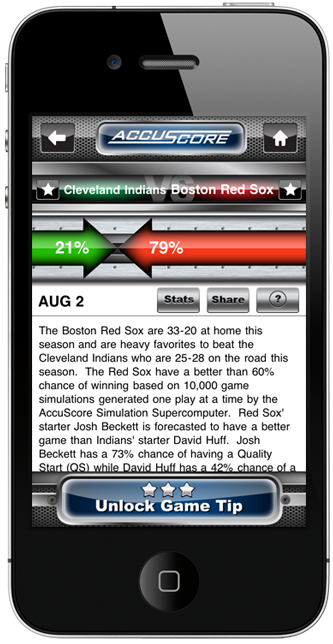 It is a free application that offers sports forecasting on every major sport. This includes the NHL, NFL, MLB, NBA in addition to College football and basketball. The app includes the forecasted winner, winning percentage for both teams, forecasted player statistics, real-time alerts and one free tip per day that projects margin of victory, total points scored in the game and who will win. Have I mentioned that this is free? Perhaps the best part of this application is the way in which Accuscore lays out each matchup. Since I’m a stat junkie I enjoy reading the projected stat lines for the star players for each team. Sometimes the matchups have incorrect player stats based on the teams you are looking at, however this isn’t an occurrence that comes up too often. Although I’m not one to gamble, this app provides me with pretty good insight as to who I should start for fantasy football on a week-to-week basis. Considering I’m on a winning streak, Accuscore certainly gets some of the credit.